• Pre-listen to the next track for flawless mixing Traktor Audio 2 - Small. Loud. iOS Ready. SMALL. LOUD. iOS READY. 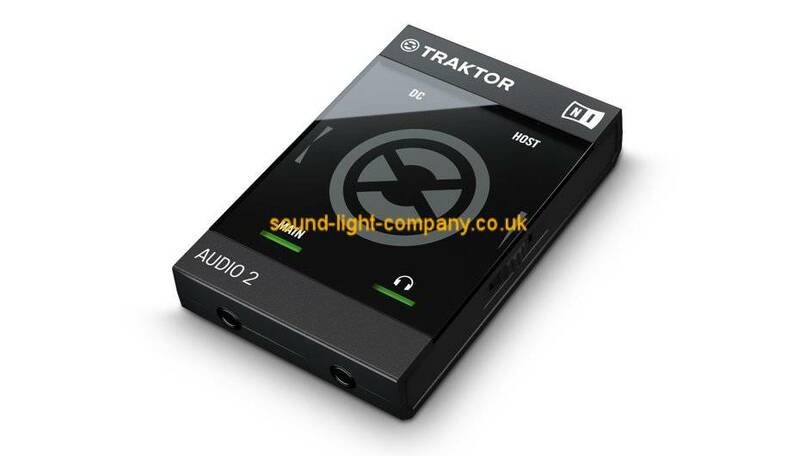 TRAKTOR AUDIO 2 is the world's smallest DJ soundcard for TRAKTOR DJ and TRAKTOR PRO 2*. Portable, pristine audio - packed with wall-shaking power. POCKET-SIZED POWER Slim enough to fit in your pocket, TRAKTOR AUDIO 2 is the ultra-portable DJ soundcard designed for TRAKTOR PRO 2 and TRAKTOR DJ. Pre-listen to your next track in premium 24-bit/48 kHz, club-ready audio - before the crowd hears it. With TRAKTOR LE 2 software and Lightning iOS cable included, TRAKTOR AUDIO 2 is the comprehensive DJ soundcard built for the road. TRAKTOR DJ READY Transform your iPad or iPhone into a solid, club-ready DJ setup. Seamless TRAKTOR DJ compatibility allows you to hook it up, rock your set, then head straight to the after party without any hassle. When using your iPad or iPhone, TRAKTOR AUDIO 2 boosts output volume. And using the optional power supply, it charges your iOS device's battery for hours of non-stop mixing. PLUG-AND-PLAY WITH TRAKTOR PRO Already on Pro? TRAKTOR AUDIO 2 is also the perfect mobile audio companion for compact TRAKTOR PRO 2 setups. AUDIO 2 splits two TRAKTOR decks into separate audio channels for pre-listening to tracks with headphones. Use it as an audio splitter alone or with DJ mixers - at home, or in the club. WHAT'S INCLUDED TRAKTOR AUDIO 2 comes with the introductory TRAKTOR LE software to get you started. Two software decks, three effects, and all you need to get the party going. And when you're ready for more, go pro. AUDIO 2 includes a £44.00 e-voucher*** - use it to purchase TRAKTOR PRO 2 or any other downloadable NI software. TRAKTOR AUDIO 2's outputs connect to standard DJ mixers. THE PRESS ON TRAKTOR AUDIO 2 "It might be properly pocket sized but Traktor Audio 2 delivers great build quality and provides a much bigger sound for iOS and mobile computer DJs." Music Tech "Loud and proud it may fit into the palm of your hand, but the Traktor Audio 2 packs a real audio punch." Mac User "The revised Traktor Audio 2 is a gem. It is high quality minuscule marvel that properly connects iOS fully with the outside world."